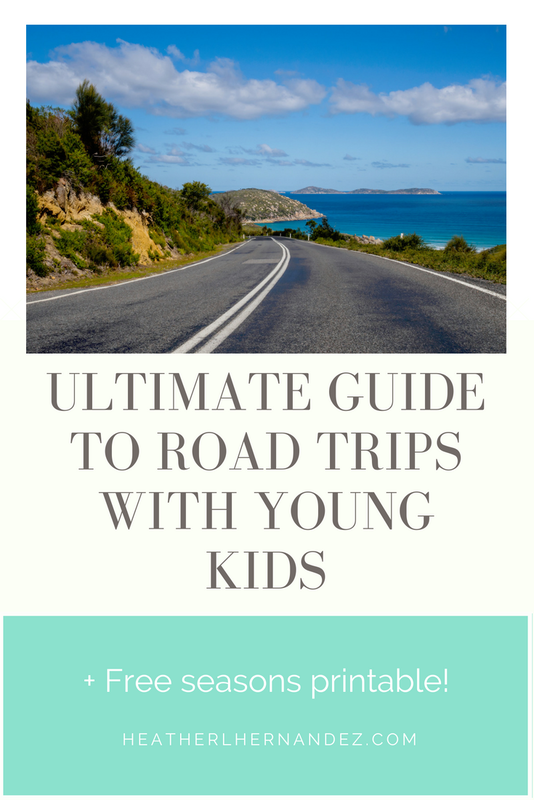 So, do you need some tips for road trips with your kids? We just got back from a 9 day family road trip to Salt Lake City for a convention and some fun family adventures along the way, so I've definitely got some tips for you! This is a hard one, but the more you have, the more of a mess it will make in the car and you will lose your mind. I can't tell you how much stuff I pack and never use. This time I was trying super hard to cut back on what I brought and I STILL had so many things I never used. This isn't specifically about kids, but I learned the hard way. It is so tempting to rely on technology on our road trips. Google Maps, and other apps to help us. It's ok to use them, but BE PREPARED for them not to work and have a physical backup! Either buy a real map for the route you are taking, or at least print it out so when you go through areas with little to no reception and Google Maps won't load, you still know how to get where you are going. There was a lot of our route that we had bad cell reception so on our way back, I made sure to write out the directions ahead of time. I had bought an Arizona road map, but not one for Utah, so next time I'll be more prepared. Seriously, sometimes Old School is just better. I tried out Roadtrippers, Toilet Finder, Gas Buddy, and IExit apps for the trip. Honestly, the only one we actually used that was particularly helpful was Gas Buddy. The other ones had trouble loading when I actually wanted them or we just never reached for it. You might like them better than I did, but don't feel like you need to have a bunch of apps to have a good road trip. DO NOT give them free access to all the activities you brought. They will churn through them and be asking for more before you can blink. Dole them out VERY sparingly. Let them look out the window, talk to them about the landscape or something to get them focused outside. Sometimes that will buy you time. Or put on an audio book and let them just listen. Then when they start getting crazy, pull out the new activity. Big sticker books were a huge hit for my kids as was a binder with a pencil bag with dry erase markers and some maps and things in page protectors that they could draw on. I didn't let them have any screen time in the car. This is just a personal preference but then when I needed them to relax and be quiet and not stomp around in the hotel in the evening, we could put on a show or something without going crazy with screen time each day. Try to stop for lunch at a park/rest stop, somewhere they can run around and burn up some energy. 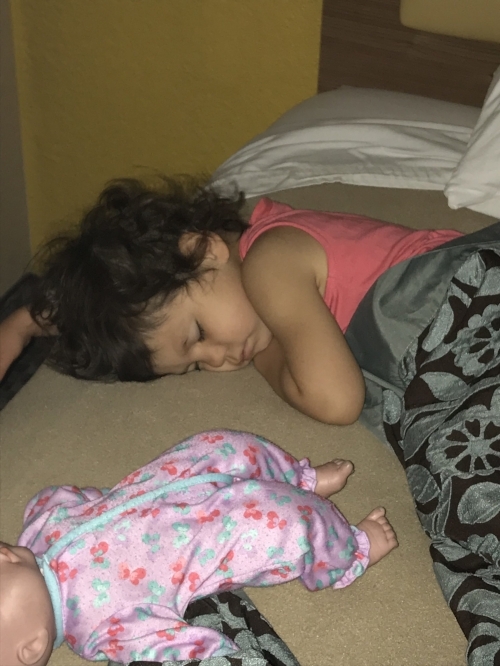 My daughter was consistently falling asleep in the afternoons when I did the 45 min drive home from my mom's house and even my son sometimes fell asleep for a bit. Did they sleep in the car on our trip? Not even once. Not even a five minute doze. Don't count on napping! DO NOT expect to get a lot done in the car, have uninterrupted reading time, get your life figured out, etc.. The kids WILL interrupt you just as you were getting started with something and twenty-five times in between. This can be super frustrating if we have expectations of getting things done. Normally I way overpack in this area but the best thing I did for my sanity this trip was to have only one book if I felt like reading and a notebook and pen in case I had the time or inclination to write something, but 90% of the time, I just let myself be. I watched the scenery and let my thoughts drift and it was what I needed. My brain had been fried and this was very restorative and it makes the interruptions less irritating. Pad your estimation for how long it will take you and be willing to let go of expectations. Things always take longer (especially with kids) than you think they will. And then your husband will decide you should stop and hike down to the river or something and if you keep your time clock in your head, it is so easy to get frustrated and anxious. Have a loose timeline but be prepared to go with the flow and be spontaneous. Lavender for when kids get crazy, and for relaxing and calming as well as little owies kids may get. Immune boosting oils diluted in a rollerball that I roll on all of our feet every night because our immune systems inevitably take a dive during trips with all the road trip food, germy hotels, and short or interrupted sleep. Peppermint and an oil blend for digestive support and relief from all the travel food. It shouldn't be so, but it is. Also realize that it will probably take them longer to actually fall asleep, especially if you are sharing a hotel room. My husband and I each had a kid in our bed and I had to literally lay down and snuggle with my son for him to calm down and fall asleep. Otherwise they roll all over the bed and get themselves all crazy and they egg each other on. Separate them and lay next to them if you need to. I made some lists on my phone while I was waiting for him to fall asleep or if I was super tired, I dozed myself. Especially toward the end of the trip and the drive home. We were gone for 9 days and that's a long time of not getting enough sleep, different eating habits, and lack of routine and structure for the littles. The ride home will not be as easy as the ride there. I stopped at Target and got a few more things at the Dollar section so they had some novel items. Have a transition plan already in place for when you get back. Especially if your trip is longer, you will need some time to adjust. We got back last night and I thought I'd be able to unpack everything before bed. Oh the delusions! I crashed and then today I crashed even harder and had to lay down and nap at 11am! It's going to take some time to ease back into your schedule, get food back into the house, unpack everything, get the kids back on their normal sleep schedule, physically recover yourself. Give your family some space if you at all can when you get back so you can recover and settle back in. Your future self will thank you for it! Have you realized a theme that seems to be running through these tips? I know I tend to make things harder on myself by the expectations I set and the rigid way I hold on to them. You may be more like my husband and not struggle so much with this, but I'm sure some of you are like me! All in all, it was a great time for us and the kids had a blast! Do You Need to Reassess Your Expectations?